What should we think of the nomination of Brett Kavanaugh to the United States Supreme Court (SCOTUS)? My view is that we should be just short of jubilant. His judicial record on the United States Court of Appeals for the DC Circuit makes it clear that he will be rock solid on religious liberty for Catholics and Second Amendment liberty for gun owners. As for Roe v. Wade, his statement during his prior confirmation hearing to the effect that he would be bound by it as a Circuit judge—he could hardly overrule it from that bench—is no indication that, as an Associate Justice of SCOTUS, he would not vote to cut back the infamous decision in ways that would amount to an abrogation if not an outright overruling. Will No One In the Hierarchy Follow the Example of Saint Paul? On April 22, 2018, Good Shepherd Sunday, fifteen priests from around the world published an open letter entitled “A Pastoral Appeal to the Bishops for an Apostolic Reaffirmation of the Gospel.” Among the signatories is EWTN commentator Father Gerald Murray, a doctor of canon law, whose appearances on EWTN with “the Papal Posse” (along with Raymond Arroyo and Robert Royal) have been instrumental in alerting the Church at large to the dimensions of the growing catastrophe of this pontificate. For the past five years the Pope of “the peripheries” has ignored the peripheries (especially the prelates of Africa) while allying himself with the government-subsidized corrupt German hierarchy in an insane drive to convert the Catholic Church into a kind of Protestant denomination. Bergoglio is the author of this catastrophe. His subversive notion of “discernment,” introduced via Amoris Laetitia, which enshrines the neo-Modernist moral nonsense of Cardinal Kasper, opens the way to “discerning” innumerable “exceptions” to the application of exceptionless moral norms. As the arch-Modernist subversive Cardinal Marx puts it: “We are talking about decisions in individual cases that require a careful spiritual discernment.” In other words, some people are to be deemed exempt from obedience to the moral law, which ultimately means all people, the end of morality in practice, and the reduction of the Ten Commandments to The Ten Ideals. Now, on the heels of Bergoglio’s reported denial of the existence of hell and the eternal torments of the damned—an opinion he has not in the least rejected or retracted a week after its publication by Scalfari, leaving Greg Burke to issue a slithery non-denial—even Cardinal Burke is admitting that the situation this maniacal Pope has provoked is nothing short of apocalyptic. “Any act of a Pope that undermines the salvific mission of Christ in the Church, whether it be a heretical act or a sinful act in itself, is simply void from the point of view of the Petrine Office. Therefore, even if it clearly causes very serious damage to souls, it does not command the obedience of pastors and faithful. Note well the statement that “the College of Cardinals constitutes ade factocheck against papal error.” Is this an indication of impending action by certain members of the College in the form of a demand that Bergoglio retract and make amends for his heterodox pronouncements and machinations prejudicial to integrity of the Faith? Was Burke that non-Italian cardinal? Perhaps in a few days, during the summit meeting in Rome being covered by Edward Pentin, we will know the answer. And perhaps, given the attendance of Burke and two other Cardinals at that meeting, we will see at last, from at least some members of the College of Cardinals, a formal correction of the most wayward Pope in Church history. This much is certain: humanly speaking, there is no way to halt the madness of Bergoglianism besides overt opposition by members of the upper hierarchy. Failing that, the end of this madness will be imposed from on high­­ under the most dramatic circumstances for the Church and the world. The AP catches the Vatican doctoring a crucial photo of a “letter from Benedict” praising Francis. It’s business as usual for the Bergoglian propaganda machine. Meanwhile, Msgr. 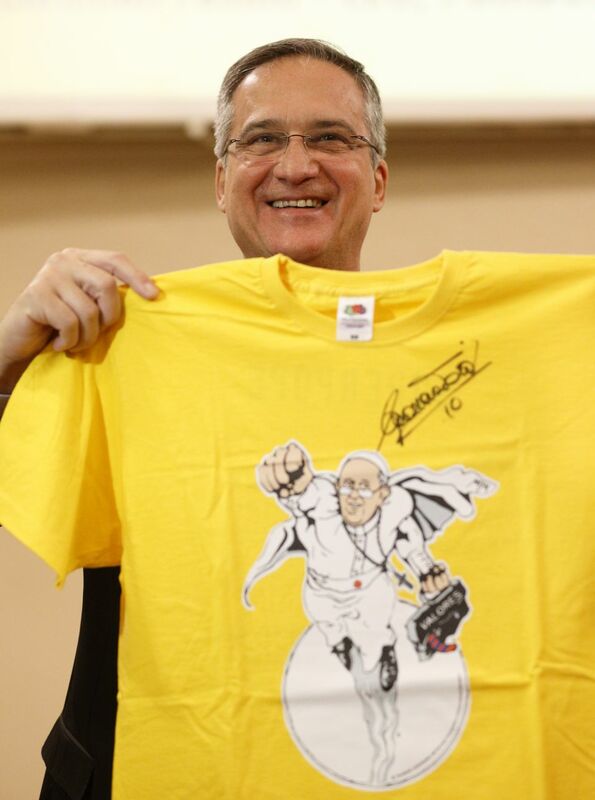 Dario Vigano, Vatican Communications/PR chief launches the SuperPope Tee.